BY OUESSALE EL ASSIMI, December 2013. 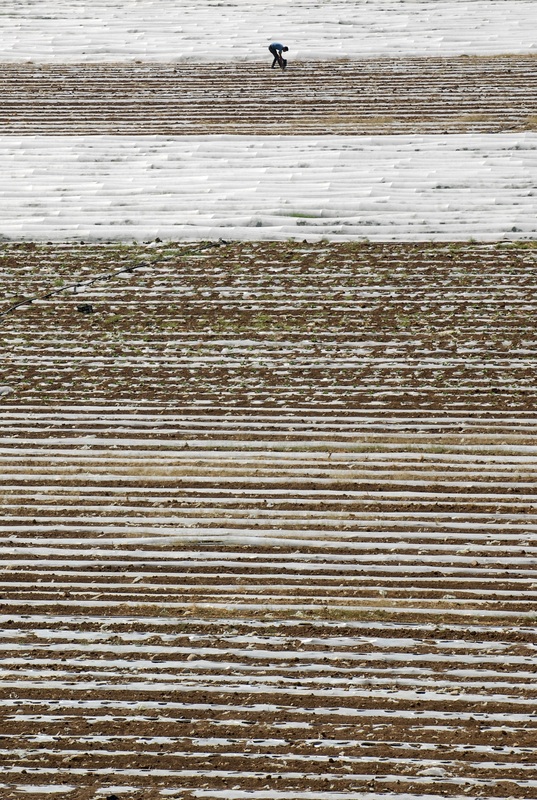 PICTURES: Guillaume de Crop, October 2013. 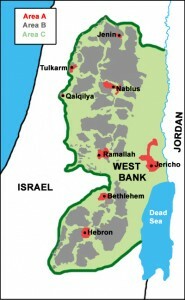 The Jordan Valley is located in the East of the West Bank, by the Jordanian border, in Area C. 95% of the Jordan Valley is under Israeli military control. Only Jericho – the oldest continuously inhabited city in the world – is under Palestinian Authority control. However, about 80,000 Palestinians live there, mostly Bedouins and small farmers, 60% of which are living under the poverty line, and 9,400 Israeli settlers live in the 36 settlements of the Valley. It’s mainly an agricultural region because of the fertile lands and the underground and surface water resources. It is THE region of industrial agriculture for exportation. According to an Ottoman law appropriated by Israel and that applies to all the occupied territories, every land remaining uncultivated for 3 years belongs automatically to the Israeli State. And the reasons for land ‘abandonment’ aren’t lacking. 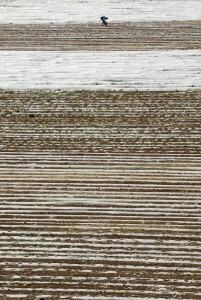 The desert climate makes water an indispensable resource for agriculture. But Palestinians are not allowed to build wells, nor to rehabilitate the old ones, which are not very deep because they date from the Ottoman period, and the pressure of the colonial industrial agriculture accentuates erosion and therefore also accelerates the salinization of underground waters. Today, it is impossible to find fresh water at a depth of less than 300 m. The Jordan River only represents 5% of the volume it had in the 50’s and barely reaches the Dead Sea, which lost a third of its surface area in the same period. Electricity and construction are forbidden and the population has to buy and transport potable water to the villages. This water is drawn from Palestinian territories and sold at prices 5 times higher to the Palestinians than to settlers and it’s controlled by the Israeli water company, Mekorot. In addition, Palestinians usually don’t have any property title for the lands because these lands were administered according to Ottoman and Jordanian collective ownership regimes, not recognized by Israel. Therefore a week doesn’t go by without a home or a Bedouin camp being destroyed, with military demolition orders in support. For those who still have a piece of land to cultivate, it is most of the time on the ‘wrong side of Road 90’. This road is reserved for settlers and forbidden to Palestinians, who only have the right to cross it to reach their fields from 6am to 6pm. To the left of the road, there are some Palestinian villages and military and natural areas. 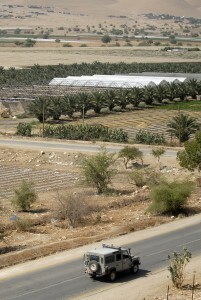 On the right, the fields, and the No Man’s Land delimited by multiple fences, including the bed of the Jordan River, and preventing access to the Jordanian border, 8 km away. One can see the Israeli plots cultivated in the river bed since 1967, when Israel occupied this small but crucial strip of land, theoretically Jordanian. The extreme poverty of farmers and Bedouin populations, the recurrent aggressions of extremist settlers, as well as the obligation by law to import all the agricultural supplies imposed by the occupier, prevent Palestinians from cultivating their land, and therefore keeping them. Thus they find themselves working in the settlers’ greenhouses, fields, groves or packing stations. All these workers, without any exception, are originally farmers who have no land anymore or no longer have the means to cultivate them, or the income they get from their land is not enough to feed their family. Just in the Jordan Valley, more than 7,000 Palestinians, including about 10% of women and 10% of children under 16 work permanently in the settlements. They’re up to 20,000 between July and October, during the harvests of dates and grapes, which are the main monocultures for exportation. They often come from far away, from Nablus, Jenin or Tubas, and 85% of them spend 30 to 90 minutes at the checkpoints in the morning and the evening, on the roads between their homes and their places of work. None of the workers have a work contract because to have one they would need a permit to enter the settlements. This permit is only delivered to the Palestinians who don’t have any police record, in a ‘country’ where 40% of the men had to experience the Israeli prisons since 1967, with or without trial. This situation is a great opportunity for the settlers because they free themselves from all their legal obligations towards the workers, despite the fact that the settlements are theoretically supposed to apply Israeli labor law (similar to ours in a more racist version). In addition, if there is a dispute between the settler and the worker, the settler just calls the settlement’s security to forcibly evacuate the protester(s), who will never be able to come back in the settlement to reclaim their due. Furthermore, the agricultural workers work in disastrous conditions: they work up to 18 hours a day, climb palm trees without any kind of safety system, handle hormones, pesticides and fertilizers without protection, even rudimentary, at an infernal rhythm. Obviously, work accidents are common, at best handicapping them for life, at worst killing them. Most of the time, Israeli ambulances (when they’re called) get rid of the injured at the closest checkpoint, despite the fact that they’re obliged by law to take them to the closest Israeli hospital. The injured workers can’t expect any financial help to pay the medical fees, which ruins the families, prevents access to proper treatment and deprives the families definitively from an indispensable income. All this for an average of 60 shekels a day (12€) and a little less for women, of course, although the agricultural minimum wage – finally defined in 2007 after years of struggle by various NGOs – is 150 shekels (31€). That’s because they have to ‘share’ their wages with intermediaries on the way. These intermediaries are Palestinians who act as recruiting agencies, managing human resources for the settlers. The Palestinian workers don’t have any direct contact with the settler. The intermediary hires the workers (by the day), transports them to their place of work (charging 15 to 30 shekels), counts their work hours (more or less honestly) and pays them after giving accounts to the settler. The amount given by the settler is never enough and the intermediaries often help themselves to a cut without the workers knowing or being able to react. In addition, if they protest, it’s easy for the intermediary to replace the problematic worker with another. This system creates a competition among the workers themselves and seriously endangers the links of solidarity between them. Moreover, there’s a veritable competition between the intermediaries themselves that has repercussions on the workers. When an intermediary transmits to the settler a demand for a raise, for instance, he takes the risk to lose his job himself and all the workers who work with him too, because there will always be another intermediary to offer the settler a cheaper and more pliable labor force. Unions are forbidden, the Palestinian Authority doesn’t have jurisdiction in the settlements and the ‘civil administration’ doesn’t deal with these issues. Striking workers are immediately fired and often imprisoned for an undetermined period ‘for security reasons’ and this is not a recent phenomenon. Strikes have been numerous during both Intifadas and the movement restrictions on Palestinians became even more draconian. The Israeli employers’ lobby maintained pressure on the government to solve the economic problems caused by the sudden lack of a cheap labor force. The government finally acceded to their insistent demand by releasing tens of thousands of work permits for the sectors of construction, agriculture and caregiving. Until now, these work permits are given to manpower agencies that work for the bosses delivering them migrants, mostly Asian, and in the agricultural sector, always Thai. Their working conditions will be the subject of a future article. The fact is that this labor force increased competition among agricultural workers. Nowadays, just in the Jordan Valley, there are more than 1,100 Thais (male and female) working in the settlements. The ‘advantage’ for the Palestinians is that this labor force is more expensive (about two times more). However, this new strategy allowing the settlers to avoid using Palestinians without losing too many benefits caused unemployment to explode, leading to a massive rural exodus and emigration from the region. As a result, more and more land falls under the ‘three years law’. Moreover, in the last years, religious-extremist settlements have been built. Not only do these settlements obviously not hire Arabs, but acts of violence against villagers, especially children, significantly increased. Today the situation seems unsolvable. Only the development of a peasant agriculture, autonomous and economical, can tackle the challenge of protecting Palestinian lands from colonization in the Jordan Valley like elsewhere. But despite the colossal work of the Palestinian and international NGOs that manage to maintain entire villages, the situation of the majority of Palestinians in the region, notably Bedouins who are mainly herders, is a humanitarian emergency. Small farmers are caught in a vice between the violent and arbitrary colonizing power and the Palestinian Authority, at best impotent and often in the service of the God Capitalism and its disastrous economic and agricultural policies. : Since the ratification of the Oslo Accords in 1993, the West Bank is divided in three areas with different levels of administration. Area A barely represents 3% of the territory and is supposed to be fully under Palestinian Authority control. 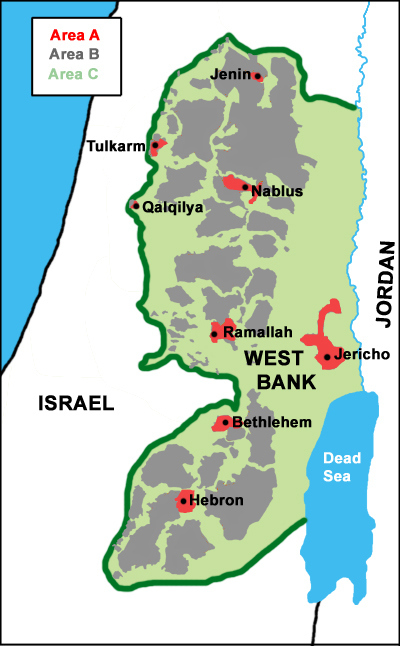 Area B represents 15% of the territory and is supposed to be under Palestinian civil control and Israeli military control. Area C represents 72% of the West Bank and is fully under the control of the ‘civil administration’ which is a body of the Israeli army that only provides civil services to illegal Israeli settlers. According to the World Bank, Area C is ‘the richest area in resources’. The vast majority of Israeli settlements are located in Area C and the Palestinians who still live there are mainly Bedouins and peasants living in conditions of extreme poverty and are widely exposed to the army’s and the settler’s violence. In this Area, all kinds of constructions and rehabilitations are forbidden and people’s movement is intensely limited by numerous checkpoints closing access to the roads to the Palestinians. : Until 1917 the region was part of the Ottoman Empire. From 1917 to 1948, the date of creation of the State of Israel, it was under the British mandate. : In Israeli law, land statutes are a mixture of Ottoman and British law. Under the Ottoman Empire, almost all land was the Sultan’s property, who would rent or sell it to individual peasants. However, to avoid speculation on the prices, the Sultan had the ability to requisition any uncultivated or abandoned land to put it at the disposal of the community. Israel fixed the period of uncultivation or abandonment at 3 years, which allowed it to seize the lands of millions of refugees so far and still today seizes those of the Palestinians deprived of their means of production. Intifada means ‘uprising’ in Arabic. It refers to the two main massive popular uprisings. The first Intifada, nonviolent and massive occurred between 1987 and 1994. The second, more violent, took place between 2000 and 2005. This entry was posted in OUR CONTRIBUTIONS, Palestine and tagged Small Farms agriculture, Campagnes solidaires, life conditions, Droit international, Slaves, seasonal work by ouessale. Bookmark the permalink.